U. S. supply train driver Captain Jason W. James describes Utah in 1858 when he made his first trip to Salt Lake Valley via the California Trail. Mormon hostilities were at that time firing up and this made his trip very dangerous. This article describes the lives and accomplishments of these two men. Further Mentions: Empress Charlotte, Archduke Maximillian, Leopold I, Louis Napoleon III, Juarez. Perhaps the saddest as well as one of the most thrilling stories in the history of Texas is known as "The Runaway Scrape." This retreat was for the purpose of helping the mothers and wives of the men in defenseless homes between San Antonio and Trinity River to reach a point of safety. These homes were defenseless because the men were all in Sam Houston's little army, which was also falling back for the same purpose. His Fabian policy was carried out brilliantly for this purpose and also by feints, to lead the enemy to divide his forces into several columns. He succeeded in both. When he reached the Brazos River he knew that the fleeing women and children had crossed that stream and had reached, to some extent, a point of safety, and in some degree they felt their load lightened. Still they struggled on to cross the Trinity. Of the few men left at home, the helplessness of age made them only a burden. But they did not leave these old fathers to die by the roadside, but kindly and lovingly cared for them. 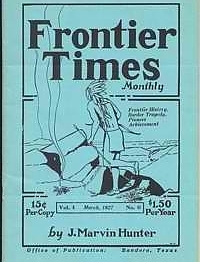 These courageous pioneer frontier women made the best preparations in their power. For teams they put into service mules, but a few, and horses, fewer, and oxen and even milch cows. Wagons and carts and old "carryalls" and buggies were all loaded to the brim with all their possessions, save the little furniture, some of it homemade. The "carryalls" and old buggies were more relics of former days of usefulness than serviceable, but they were utilized. Some of their carts would have been a drawing feature in a sideshow at a circus. The wheels were made from huge trees that were felled to the earth and wheels were sawed out of the big boles. Food was scarce, weather unpredictable and the Indians of East Texas were on the prowl. This is the story of the plight of these brave Texans. Account of Miss Belle Vanderver, daughter of a Texas ranchman, who was married to D. M. Barton, who had been "brought up" on a ranch in a neighboring county, and helped her young husband drive five hundred head of cattle through the "Indian Country" to Western Kansas. It was a wedding journey. Miss Vandever lived in Burnet County, Texas. Mr. Barton was born and reared in Mason County. Both counties are in the neighborhood of Austin. Harvey Logan, alias `Kid Curry,' and the most desperate brigand of them all, who with Longabaugh made his last public appearance in the United States when they held up and robbed a Denver & Rio Grande train at Parachute, Colorado, and although pursued by posses, eventually reached South America with their loot." 18 Indians attack two white men, who then return to the settlement, gather reinforcements, and teach the Indians a lesson! Further Mentioned: Clear Fork Valley, Mule Creek, Haskell, Double Mountain River, Brazos, Weatherford. Andy McDonald, Arch Ratliff, Joe Mathews, John Glenn, T. E. Jackson, G. T. Reynolds, W. D. Reynolds, M. Anderson, Nelson Spears, Si Huff, Jim Derky, Elsy Christianson. Account of the man who was a popular and successful public servant, politician, and diplomat. Browning was born February 3rd, 1857, near Seguin in Guadalupe county, Texas, and became well known to many people in West Texas. His boyhood days were spent in the county of his birth and Gonzales county where he secured most of his education. - In 1874 he moved with his parents to Kimble county, Texas, and settled near the mouth of Gentry Creek. Further Mentions: J. A. Browning, A. P. Browning, Isaac Kountz, Mr. Spear, Dowdy, Mason, William Potter, E. K. Kountz, Frank Latta, N. Q. Patterson, W. F. Gilliland, M. J. Denman, J. R. Steffy, Felix Burton, Henry Pearl, Noah Knox, Newt Dorbandt, G. W. Hodges, Miss Josie Childs, the first county officers were Wm. Potter, County Judge, E. K. Kountz, County Clerk, Frank Latta Sheriff, N. Q. Patterson, Treasurer, W. F. Gilliland, Assessor, M. J. Denman, Surveyor. The Commissioners were J. R. Steffy for Junction City, Felix Burton, Bear Creek, Henry Pearl, Saline and Noah Knox, Devil's River. Account of Mrs. Rosalie Dietert, remarkable pioneer woman who was 70 years a Kerr County resident. The Dietert name is closely interwoven with the early history of Kerr County from the perilous days when there was little save wilderness on the spot where the city of Kerrville now stands. Miss Rosalie Hess was born in Jena, Germany, on January 17, 1833, and having heard of the wonders of the new world, she left her home in the old country and on March 15, 1854, embarked with a party of friends on a sailing vessel, bound for Texas. After eight long weeks on rough seas, the boat landed at Galveston, "from whence" 'the party of German settlers were transported to Indianola and began the hazardous trek to New Braunfels, then the mecca of all German immigrants to Texas. This journey was even more tiresome than the ocean voyage, as the country was for the most part covered with water from six to 12 inches in depth. There were no roads or dry camping places and the danger from warring Indians was ever present. Approximately five month's time was required to make the trip from Germany to New Braunfels. After a short stay at New Braunfels, Miss Hess came to the Guadalupe Valley to reside with the family of Mr. and Mrs. Theo. Wiedenfeld, near where the present town of Comfort is located. This was the beginning of her long residence in Kerr Co, and Comfort, TX. 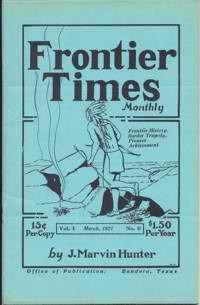 Further Mentions: Cynthia Ann Parker, Quanah Parker, Henry C. Fuller, A. W. Meredith, Rachel Plummer, James Plummer, Nixons, Elizabeth Kellogg, Robert Frodt, Dwights, Faulkenburgs, Mrs. Duty, Silas Bates, Mr. Lunn, Abram Anglin, John Parker, Silas Parker, Ben Parker, Sam Parker, Sam Houston, Elder Parker, William Donoho, Major Earl Van Dorn, Sul Ross. Locations: Old Fort Parker, Brownwood, Wills Point, Groesbeck, Nacogdoches, Palo Pinto County, Pease River, Cedar Mountains. Gov Adams; Al Alkres; Clay Allison; M. Anderson; Abram Anglin; Mrs Bessie Parker Asenap; Ethel Barrymore; Lionel Barrymore; Maurice Barrymore; Mrs Belle Vandever Barton; D. M. Barton; "Dock" Barton; Silas Bates; Jack Bennett; Neda Parker Birdsong; Walter Blake; John Winnfield Botts; William Botts; J. A. Bronwing; Mrs Josie Childs Brown; A. P. Browning; J. A. Browning; S. B. Burnett; Felix Burton; Monte Butler; Capt James H. Calahan; Col Caldwell; Maj Calvert; John Maj Caperton; Maj Caperton; Col Carrasco; Bill Carver; Butch Cassidy; Butch (See Parker George) Cassidy; George (See George Parker) Cassidy; Samuel W. Chambers; Empress Charlotte; Mike Chevalier; Miss Josie Childs; Elsy Christianson; Mrs Edward Clark; Mrs Orange Clark; Gen Coffee; Capt Crockett; Davy Crockett; Bob ("Red Rob") Culp; Jim Currie; L. E. Daniell; M. J. Denman; Jim Derky; Christian Dietert; Rosalie Dietert; Billy Dixon; Dobie; William Donoho; Newt Dorbandt; "Tap" Duncan; Gen Elias; Lena Miss Enderle; Robert Frodt; Henry C. Fuller; Ad Gillespie; Capt R. A. Gillespie; W. F. Gilliland; John Glenn; Garrison Greenwood; J. H. Greenwood; O. C. ("Deaf Charley") Hanks; Capt Hays; Jack Hays; Col Jack Coffey Hays; Jack Col Hays; Gen Hearney; Gen Hearny; Al Heiner; Gen Henderson; Gen Maj Henderson; Miss Rosalie Hess; Sam Highsmith; Francis W. Hilton; Frank H. Hitchcock; G. W. Hodges; W. C. Holden; Gen Hood; Hough; Houston; Valentine S. Hoy; Claude B. Hon Hudspeth; Si Huff; Capt (See Parker George) Ingerfield; Capt Jackson; Gen Jackson; T. E. Jackson; Capt Jason W. James; Col Thomas D. Johnson; Col Albert Sydney Col Albert Sidney Johnston; Lewis Johnston; Lewis ("The Big Swede") Johnston; Mrs Eli Jones; Mrs Elizabeth Kellogg; (See Harvey Logan) Kid Curry; Lt; Killiher; Ben Kilpatrick; Tom King; Noah Knox; Saline Knox; Moroni Kofford; E. K. Kountz; Dr E. K. Kountz; Issac Kountz; Miss Nina Kountz; Gen Lane; Frank Latta; Bishop Lee; Tasie Lockhart; Taisie Lockhhart; Harvey Logan; Harvey (alias Kid Curry); Harry Longabaugh; Harry ("Sundance Kid"); Longley; A. B. Macdonald; Chris Madden; Joe Marlgren; Masterson; Joe Mathews; Archduke Maximillian; L. Maxwell; Col May; Lew McCarty; Capt Benjamin McCulloch; Gen Henry E. McCulloch; Maj McCulloch; McCulloch; Andy McDonald; Bob Meeks; Tom Meggerson; A. W. Meredith; Milam; Ben Moore; G. R. Moore; Jack Moore; Gen Mormaduke; Rev Z. N. Morrell; Louis III Napoleon; Capt S. G. Newton; J. Marvin Nichols; Chief Nocona; Maj Ormsby; Ben Parker; Benjamin Parker; Bladwin Parker; ; Esther Parker; George L. (Butch Cassidy) Parker; George LeRoy Parker; James Parker; James W. Parker; John Parker; Mrs John Parker; Sam Parker; Silas Parker; White Parker; N. C. Patterson; N. Q. Patterson; Henry Pearl; Capt Peryer; Jack Peterson; Gen Pierce; H. Clay; James Plummer; Mrs Rachel Plummer; Pres Polk; William Potter; Arch Ratliff; Bill (Elza) Ray; Dr Ray; G. T. Reynolds; W. D. Reynolds; Gov Richards; Roberts; Rose; Joe Ross; Sul Ross; Saunders; Aime Schreiner; Charles Schreiner; Charles A. Schreiner; Capt Charles Schreiner; Charlotte Schreiner; Emilie L. Schreiner; Fannie H. Schreiner; Gustave A. Schreiner; Gustave H. Schreiner; Mrs Lena Enderle Schreiner; Louis A. Schreiner; Walter R. Schreiner; Scott Schreiner; Gen Schreiner; Col Joe Selby; Alfred Shelby; Sowell; Nelson Spears; J. R. Steffy; Capt Storey; Capt Edward Storey; Willie Strong; Clifton Seymour Stuart; Gov Stuenenberg; (see Longabough Harry) Sundance Kid; Gen Taylor; Will Taylor; Mike Terdell; Frank Thomas; Mrs Frank Thomas; J. M. Thomas; Cov Thompson; Jess Truett; Tom Truett; John Twohig; Earle Maj Van Dorn; Col Van Horn; Belle Miss Vanderver; Belle Vandever; Capt Walker; Joe Walker; Sam Walker; Samuel H. Walker; Capt Samuel H. Walker; Wallace; Matt Warner; Henry Weiss; Mrs Henry Weiss; Gov Wells; Heber Gov; Theodore Wiedenfeld; Mrs Theodore Wiedenfeld; Brooks Williams; Mrs I. M. Williams; Matt Williams; Gen Woll; Gen Worth; Worsham.